The Ohio State University Department of Arts Administration, Education and Policy prepares educators and policy makers in the areas of art education, arts policy and administration. The department’s legacy has been built on the distinction of its programs; the research, teaching, and service accomplishments of world-class faculty; and the diversity and aptitude of students and alumni. In the global economy, creativity is essential. The process of making art—whether it is written, performed, sculpted, photographed, filmed, danced or painted—prepares children for success in the workforce not simply as artists, but all professions. 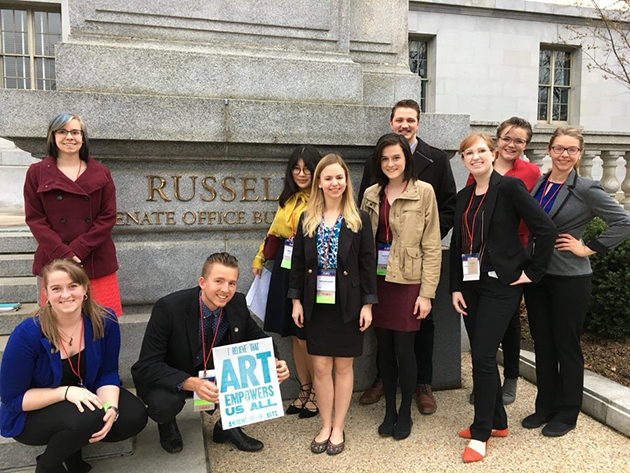 Ohio State AAEP students joined arts advocates from across the country in Washington, DC for the annual Arts Advocacy Day March 19–21, 2017. Arts Advocacy Day also provided the opportunity for our students to receive advocacy training from experts and put that training into practice. Our students met with our members of Congress in support of issues like arts education policy, the charitable tax deduction and funding for the National Endowment for the Arts. Columbus Museum of Art, Dublin Arts Council, Wexner Center for the Arts, King Arts Complex, Columbus Public Schools, Metropolitan Libraries, Ohio Art Education Association. International Society for Education through Art (InSEA), World Alliance for Arts Education, Edna Manley College of the Visual and Performing Arts, United States Society for Education through Art (USSEA), The National Art Education Association (NAEA), and The National Arts Education Consortium— a unique national initiative in arts education reform, designed to assist schools committed to using comprehensive approaches to arts education integrated with whole-school reform strategies to improve student achievement. THE DEPARTMENT WELCOMES THE CULTURAL AND EXPERIENTIAL DIVERSITY OF ITS STUDENT POPULATION. OUR INTERNATIONAL PARTNERSHIPS ENHANCE THE DEPARTMENT AND INFLUENCE OUR STUDENTS THROUGH STUDY ABROAD PROGRAMS IN JAMAICA, CHILE, FINLAND AND IRELAND.